Mankind has a long history of marijuana use that dates back thousands of years. According to scientists from the German Archeologists Institute, humans have used cannabis since Europe’s glaciers first began to retreat during the Stone Age 10,000 years ago. Long before cannabis ever reached America, it has a long history of use in Asian and European countries. Ancient Chinese medicine utilized marijuana for a variety of physical ailments—with ancient texts even recommending its daily use to improve overall health. The nomadic Scythian people from the geographical region of modern-day Iran are another culture with a history of cannabis use. They used marijuana in sacred ceremonies to induce a trance-like state of mind in seek of divination. There are conflicting opinions that the ancient Greeks and Romans may have used cannabis for psychoactive purposes as well. Some historians maintain that ancient Greeks burned hemp incense in containers and tripods, which they would place in tents and gather around, inhaling the smoke for ritualistic reasons. This should come as little surprise. Throughout recorded history and before, humans have sought spiritual enlightenment and the expansion of consciousness from mind-altering substances. That practice occurs to the present day with ayahuasca ceremonies and other rituals that involve mind expansion through the use of chemical consumption. In America during the 1960s, the use of marijuana and LSD was widespread and used largely to expand consciousness and gain knowledge about man’s role and purpose in the universe. Clearly, there is a universal tendency among many cultures that psychoactive substances—including marijuana—help humans attain spiritual knowledge and enlightenment. Ancient practices involving marijuana use, including ancient Germanic Paganism, eventually evolved to include major religions. During this annual celebration, people consume “bhang,” which is an elixir that contains cannabis flowers. When Hindu people drink this elixir, it is believed to cleanse sins and unite them with the Hindu deity Shiva, protecting them from the evils of hell in the afterlife. Hindu people believe that Shiva created cannabis from his own body. Buddhist believers have a long history with cannabis that dates back to the fifth century BC. The sage who established the Buddhism religion, Gautama Buddha, is thought to have lived off of one hemp seed per day while on his journey to enlightenment. Buddhism has five precepts (five rules of training), and the fifth precept is often interpreted to mean “refrain from intoxicating drinks and drugs that lead to heedlessness.” Other interpretations of the fifth precept indicate that it specifically refers to alcohol. Mahakala, a deity common to Hinduism, Buddhism, and Sikhism, prescribes the use of cannabis and other psychoactive plants for medical purposes in the Mahakala Tantra. 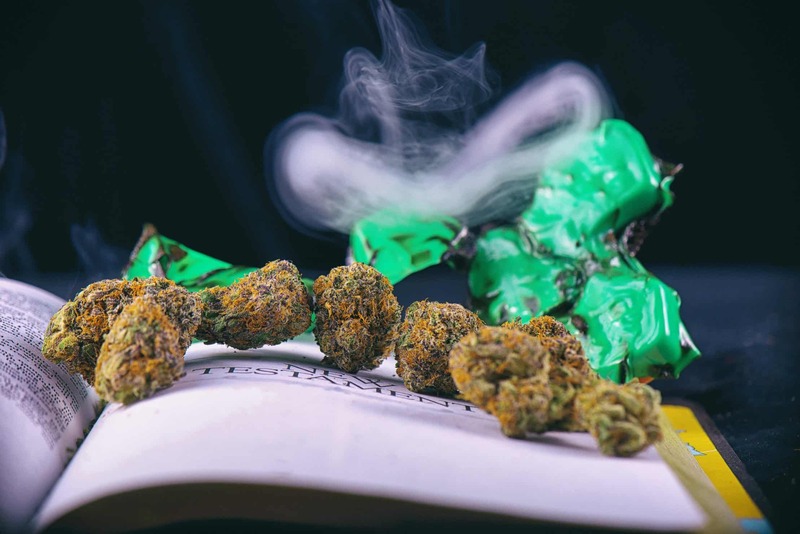 Although the Quran does not specifically forbid the use of cannabis, many religious scholars maintain that it’s considered an intoxicant, and is thereby forbidden. Despite this dictum, cannabis is widely used in many areas of the Islamic world. Modern Islamic practices have a different take on the plant. There are some modern Islamic leaders who proclaim that cannabis use for medical purposes is allowed, but recreational use is still forbidden. The use of marijuana is somewhat controversial among some Islamic people because neither the Quran nor the prophet Mohammed directly addresses the use of cannabis. Whether or not cannabis has a history with ancient Judaism is a controversial topic. While most mainstream scholars reject the possibility, other historians claim that the holy, anointing oils mentioned in the Book of Exodus contained cannabis. The use of marijuana by Jewish people in modern times is somewhat like the situation with cannabis and Islam. The use of medical marijuana is permissible, but the use of recreational marijuana is forbidden. The Official Church of Scientology strictly forbids the use of cannabis. There is little doubt about its position on the matter. During its 2016 World Health Day presentation, the “Truth About Marijuana” was its primary focus. Perhaps the most obvious use of cannabis among major modern religions occurs with the Rastafarians. Many people know the Rastafari as people of African ethnic origin who live in Jamaica, wear dreadlocks, and have a passion for smoking marijuana. While this is true to a certain extent, not all Rastafari smoke marijuana and live in Jamaica. Nor do they all grow dreadlocks—although that is an extremely common practice. Many people learned of Rastafarians from reggae music and musicians like Bob Marley, Peter Tosh, and Bunny Wailer, who gained popularity during the 1970s and 80s, embraced Rastafari and openly smoked cannabis. Rastafarians are passionate about smoking marijuana, which they consider sacramental and an extremely beneficial plant. They view cannabis as the Tree of Life from the Bible’s Book of Genesis. Long-stemmed water pipes called chalices is a preferred vehicle for consuming cannabis when Rastafarians gather for “reasoning sessions” to discuss their faith and way of life. The various Christian denominations do not endorse the use of cannabis. The position Roman Catholics have with cannabis was defined by Pope Francis, who in 2013, prior to his assuming popehood, spoke out about recreational marijuana. Its use, except for medical purposes, is strictly forbidden. Protestants also denounce marijuana as harmful and forbidden. Baptists, a denomination of Protestant Christians, do not allow cannabis use. Most of them also consider alcohol to be morally wrong and against Christian principles, regardless of its use in the Bible. In 2016, the Baptist State Convention voted to discourage the use of medical marijuana. Baptists in Florida have been encouraged to vote against the expansion of medical marijuana in the state. Pentecostal Protestants historically abstain from consuming alcohol, cannabis, tobacco, and narcotics in general. These people generally cite Bible passages that forbid intoxication to support their practices. Protestant denominations that endorse the use of medical marijuana include the Presbyterian Church, United Methodist Church, Episcopal Church, and the United Church of Christ. Various world religions have an inconsistent philosophy about cannabis use. The views are so divergent that some consider it essential and deeply beneficial, while others view it as almost immoral and evil. Throughout history, various geographical areas, ethnic groups, and religions have formed their own codes and belief systems when it comes to the plant.